SELLER WILL PAY UP TO $5000 IN PURCHASERS CLOSING COSTS WITH AN ACCEPTABLE OFFER! Super close to Blacksburg, this private home overlooks the mountains with two sunrises every morning! Renovated kitchen with granite tops a separate side by side full sized refrigerator and freezer, make cooking a pleasure. Enjoy hardwood floors throughout the main level, along with masonry and gas fireplaces, plus a flu in the lower level game room. Built in bookcases can transform one of the bedrooms into a perfect home office. Double your living space by stepping out onto the covered and uncovered HUGE deck. Picnic in the yard or on the concrete patio. Huge detached workshop could easily be converted into a detached double garage. Brand new HVAC system in home for added comfort. 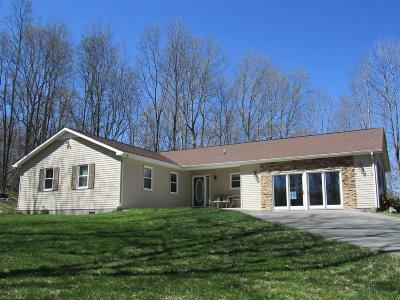 Very private yet oh so close and convenient to VT.
Deck Dim/Descrip: 641 Sq. Ft. Directions: 460 W To First Left Past Rt 42 Onto Alpine Drive. Go .85 Miles Home On Right.